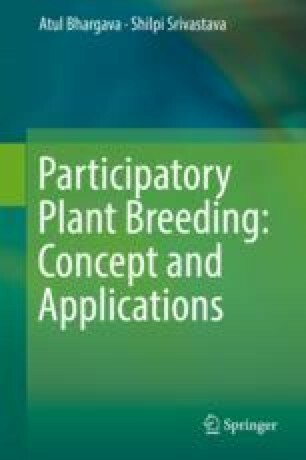 Plant breeding is the continuous endeavor to develop superior plant phenotypes that are better adapted to human needs by utilizing the available genetic variation. It has been practiced for thousands of years ever since the beginning of human civilization, initially as an art by the farmers and later as a science by breeders. The aim of plant breeding is to improve the quality, diversity, and performance of food, fiber, forage, industrial, and other economically important crops. Crop breeding is a rapidly advancing science and has made use of recent genetic and biotechnological innovations to efficiently develop better crop varieties. After initial genetical work by Mendel on garden pea, the later part of the nineteenth century saw a jump in the interest in plant breeding with the cultivators aiming at producing hardier and higher-yielding crops. Rapid advances using conventional breeding techniques led to Green Revolution during the period between 1960 and 1980 when a remarkable increase in the production of wheat and rice was achieved primarily in wheat and rice by development of high-yielding varieties. Advances in plant biotechnology, molecular markers, and genomics have enabled breeders to formulate new tools for the analysis and manipulation of genetic variability and the development of improved plant types. Molecular tools are being increasingly used in plant breeding to widen its impact for meeting the global needs for sustainable increases in agricultural productivity.